With yesterday’s announcement that Cenk Uygur will be hosting a show beginning in the fourth quarter, Al Gore’s Current TV cable network is fast becoming a second home for former MSNBC hosts. Uygur, whose trial run on MSNBC failed to move the ratings dial, will now take his show to an even smaller platform at Current, which can be seen in about 60 million homes compared to MSNBC’s 95 million. The addition of Uygur should give Current an audience lift similar to what it experienced when Keith Olbermann debuted on the network, but just like Olbermann he has a very low bar to hurdle as Current’s audience in the 7 p.m. hour is merely a blip on a radar screen. Uygur expressed his approval for the deal when he told TV Newser that he was “happy to be at 7 o’clock because there is no other progressive at 7 o’clock on television, so it kind of leaves the field to me.” That’s partially true since he will be facing off against Shepard Smith at Fox and Erin Burnett at CNN, but where does that leave Chris Matthews, whose show repeats in that hour on MSNBC? 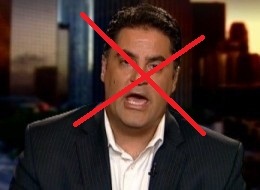 Even though he flamed out at MSNBC it didn’t deter Current’s enthusiasm for Uygur. At least the truth as Uygur’s sees it. What Gore and the other executives at Current are clearly hoping for is that Uygur will be able to bring a large swath of his online viewership to the network which could use some good news. Uygur’s online show receives 30 million views a month and according to Current has grown 912% since July 2008. But Gore and company may be a little too optimistic about Uygur’s ability to convert online viewers into cable viewers. After all, he had a program on MSNBC, which reaches 50% more homes than Current, and when put to the test he often failed to beat CNN in his time slot, something Ed Schultz had no problem doing last year in the same time period. Another problem is that the young viewers that Uygur is so popular with aren’t big cable television watchers when given the opportunity to have the same content streamed to their computer or mobile device. Since Uygur will still be producing an online show, what is the incentive to watch him on television, especially on a network that is not widely available and is difficult to locate when it is? Current has already experienced disappointment with Olbermann’s new show, which has attracted a fraction of his MSNBC audience and whose ratings are going downhill fast. And with Uygur’s more fickle online audience it doesn’t look like things will be any different this time around.